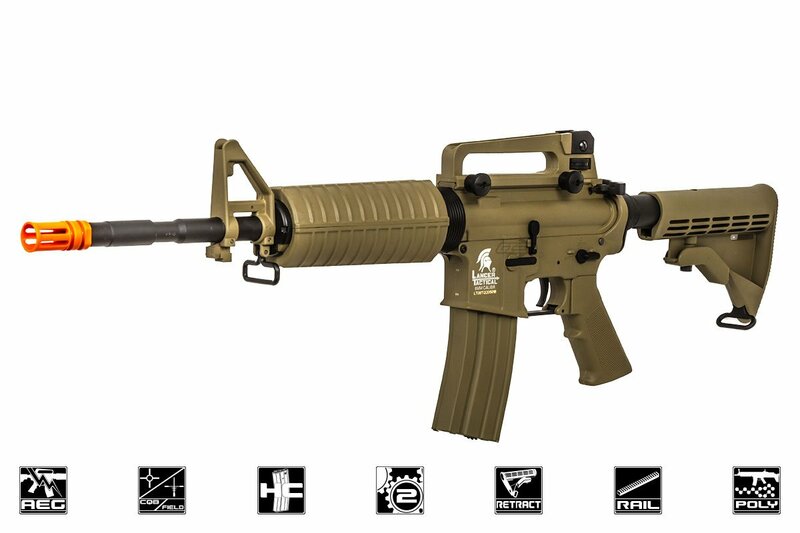 Step into the airsoft battlefield with the second generation of Lancer Tactical airsoft rifles. The Lancer Tactical Generation 2 M4A1 Carbine features a newly upgraded, nylon-reinforced polymer body. That makes it a tough, durable rifle that is also lightweight and maneuverable, so you can stay in the fight longer. The gun also features an adjustable front and rear sight, letting you dial in and zero your shots, and a detachable carry handle for attaching your favorite optic. Two sling loops are located at the front and rear of the rifle, and attaching a sling to make the rifle more comfortable to handle is a breeze. Internally, the second generation of the Lancer Tactical comes with a standard Version 2 gearbox. That makes upgrades and modifications easy. These upgraded gearboxes come out swinging, with an upgraded motor, 8mm ball bearings to ensure the gears spin more efficiently with less friction, a quick-change spring system and low-resistance wiring to ensure the steady electrical flow from your battery to your rifle. The rifle also features a 6.03mm tight-bore barrel and a rotary dial hop-up unit to deliver more precise, accurate shots at range. This model shoots approximately 375 to 395 feet per second out of the box, perfect for long-range engagements. Best of all, each of these guns comes with a high-capacity magazine, a 9.6V battery and a standard wall charger. If you have never played airsoft and are looking to get your feet wet or simply are an established player on a budget, this gun is a smart option. Easy to maintain and effective in combat, this weapon is remarkably sturdy for its price and will give you dependable service in the field. Your teammates and opponents will also appreciate the classic M4 look of this gun, and you will enjoy a high fun/cost ratio with this carbine. It also would make a great gift for that friend who you have been trying to introduce to airsoft competition. 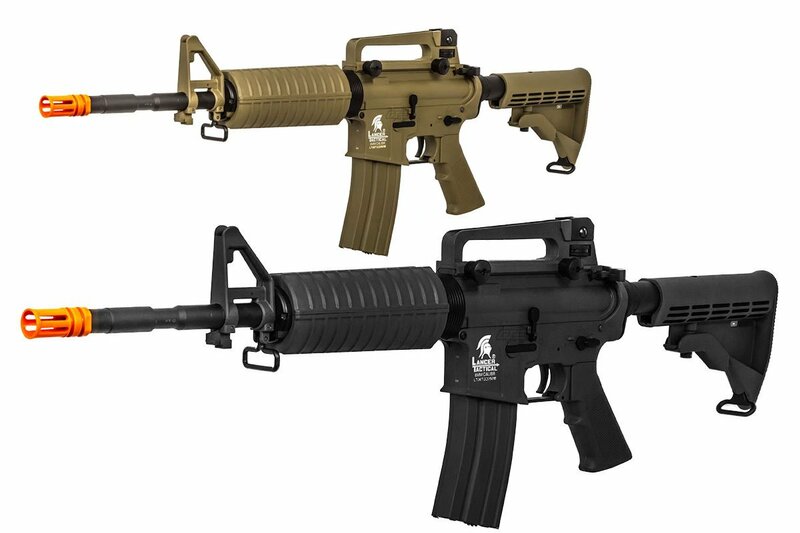 So pick one up and enter the fight with this outstanding example of Lancer's second generation of tactical M4 carbines. The online PDF manual for the Gen 2 Series can be found clicking here. Well let me start off by saying that this is in no way a top tier gun by any means but it gets the job done and is a great beginner gun. The front hand guard is a little wobbly and the battery storage isn't great but you can fit standard 9.6 batteries. The range and fps is decent and you can compete with others on the field if you adjust the gun enough but with wind I would recommend .25g bbs to punch through heavier cover. But in the end if you are looking to get into the sport of air soft then I defiantly would consider this and their is always upgrades available. This product is a really good gun for beginners. I got mine about a year and a half ago and it runs fine. The only problem I have had with it is that my stock broke of, but it was replaceable because the buffer tube didn't break.